Our custom shop differentiates us from larger competitors by and enables us to cross cut and rip product for you. We provide storage sheds in standard and custom sizes, delivered right to your site and ready to use. In addition we build dog houses, feeders, picnic tables,, steps, decks, hayracks, log racks, and other custom wood projects and repairs. 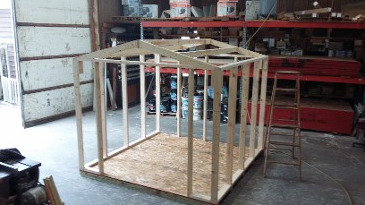 Sheds are fabricated in 5 standard styles as well as custom designs, using top grade material. All shop projects can be delivered, ready to use and enjoy.